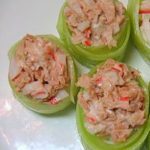 A simple tuna cucumber sushi rolls recipe. 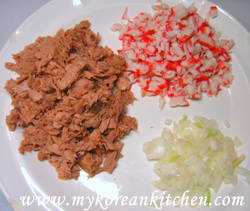 No, it is not a traditional Korean food, but it is quite a simple meal to make. I do not know if this sushi is available in Japan or not, but I know this is very delicious to eat! It will make a great party finger food. 1. Cool down the steamed rice for about 10 minutes. 2. 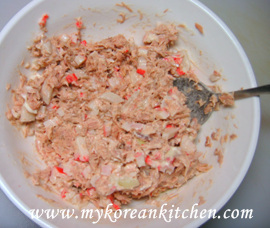 While waiting, finely chop the onion, tuna, and crab sticks. 3. Put them into a bowl. 4. 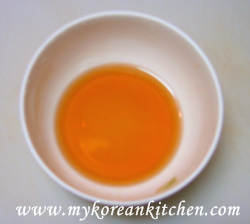 Add the salad sauce into a bowl (from step 3) and mix it well. 6. Boil the sushi seasoning in a pan until the sugar and salt dissolve. (You can use a microwave instead.) Pour it over the rice and mix it well. 1. Wet your hands in cold water then make 12 balls of rice. 2. 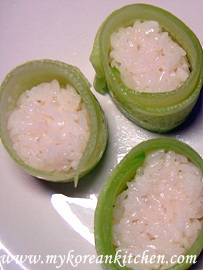 Wrap the rice around with thinly sliced cucumber. 3. Put the tuna and crab salad on top of the rice. 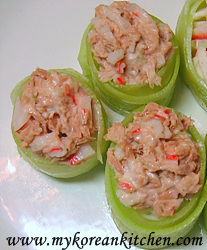 The height of rice’s dough ball should be lower than the sliced cucumber’s height to hold the tuna salad topping. Cool down the steamed rice for about 10 minutes. 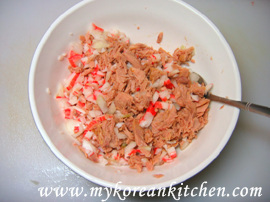 While waiting, finely chop the onion, tuna, and crab sticks. Put them into a bowl. Add the salad sauce into a bowl (from step 3) and mix it well. Boil the sushi seasoning in a pan until the sugar and salt dissolve. (You can use a microwave instead.) Pour it over the rice and mix it well. Wet your hands in cold water then make 12 balls of rice. Wrap the rice around with thinly sliced cucumber. Put the tuna and crab salad on top of the rice. This site rocks! Me and my wife just made sushi for the first time and with this site we nailed it! Awesome stuff! It sounds like something i would eat. I think it will taste good and people would love it because it has a nice balance. I think you should use it as an appetizer. 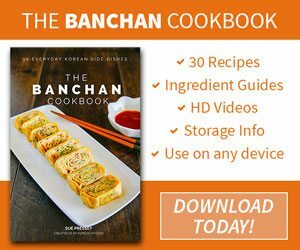 Korean Restaurant Guide is a great site. If I lived in the USA I would probably use it a lot to find good Korean restaurants. 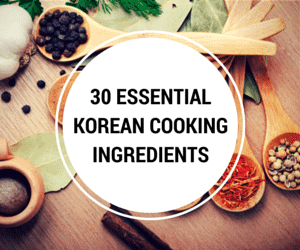 It is also a great guide to Korean food. The rice cake I’ve seen in the korean store is round and flat shape. I saw some pictures on the internet looks like rice cake soup to me…but I don’t know if I am correct or not. Thanks again!! 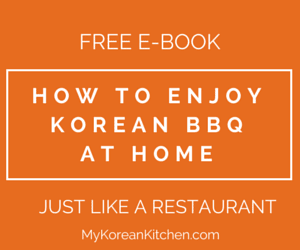 By the way, I found one website called “korean food recipe restaurant guide”. I cooked some dishes from that, actually they turned out like the restaurants I tried before. If you have chance, you can take a look and please tell me what you think. Have a great day!! Thanks again!!! I don’t mind questions. So feel free to ask. I just made a comments and questions section on the top, next to the site map, so you can ask general questions there. I haven’t seen spicy tofu kimchi, there are lots of types of kimchi, so that might be something I don’t know. sorry about that. I have mentioned 4 different types of rice cakes on my blog, so I don’t really know which one you are talking about. These are my posts about rice cakes, can you tell me which one you bought? 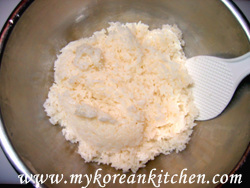 Are you asking about sweet rice cakes as a snack or rice cakes for cooking? Thanks for sharing your recipes again. I try to make some korean food and Thai food at home sometimes. Because most of time, I cook Chinese food. (I am from Taiwan) Last time, I had some kind of spicy tofu as kimchi in the restaurant. I think they serve that as kimchi. Do you know what that called and also how to make it? Also, I saw rice cake has two different kinds of shape in the korean store today but I bought the one you show. What is the different between them? I guess I have too many questions.. Thanks again!! There are too many recipes I want to try, so it’s hard to keep up. I’ve never seen this type of sushi here, but you never know. I’ve recently seen kalbi topped on the rice, using nori to keep it together at the kaiten sushi (rotating sushi) places. Your sushi sounds easy and delicious.